Unless Boise’s Team Dave has quietly appointed a new person to oversee police “critical incidents,” the current ombudsman will be in a position to both investigate and defend Boise coppers. 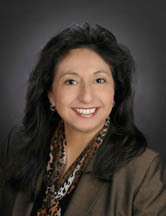 Seems that Natalie Camacho Mendoza, the ombudsman, is also the interim Boise City Attorney, according to an e-mail notification sent to Fourth District Court. While Boise’s police department has undergone fewer questionable police misconduct charges in the recent past, the GUARDIAN still questions the ethics of having the same attorney defending the police (and city) whose duty it is to represent the public and hold the coppers accountable. Sounds like a conflict to us. We hear there are plans afoot to name one of Camacho Mendoza’s part time assistants to the part time position. Check her LINKEDIN page. After the GUARDIAN posted this story, the IDAHO PRESS contacted the mayor’s office where it was suddenly revealed the former city attorney, Robert Luce, was no longer at the helm of the legal department, Camacho Mendoza was the acting boss, and investigator Cliff Ohler is now the interim director of the office of police oversight. The moves were termed “administrative action,” which means there was no transparent public city council decision process as there normally is when these jobs are filled. After the GUARDIAN story posted, another legacy media outlet was told Camacho Mendoza had left the ombudsman post and an interim replacement had been appointed, but the city was not ready to release the name. Mr. Mayor, you are losing us!!! Firstly, the commies kill anyone who might be smart enough to figure out they are completely full of crap, so be careful. What are we looking at here? This is a great example of the commie concept. (minority woman) is simply a paid place holder…. doing nothing of course…. for a bunch of money (prime directive of any lawyer). True to commie takeover concept, most people are clueless as to why this fraud matters…. also most not smart enough to figure out… The masses are far more concerned about tonight’s warm beer crisis and cold Domino’s crisis. I see nothing here that won’t be overcome with a Disneyland-like circulating trolley in Boise. Nuts? No! Sad but mostly true. EDITOR NOTE–potentially offensive reference edited out. Is the city attorney’s office leaking lawyers? The chief deputy left quietly this summer, now the boss. You have to admit that they’ve been giving some strange legal advice lately. However, “commies”?! I don’t think so — more like (petty) oligarchs. 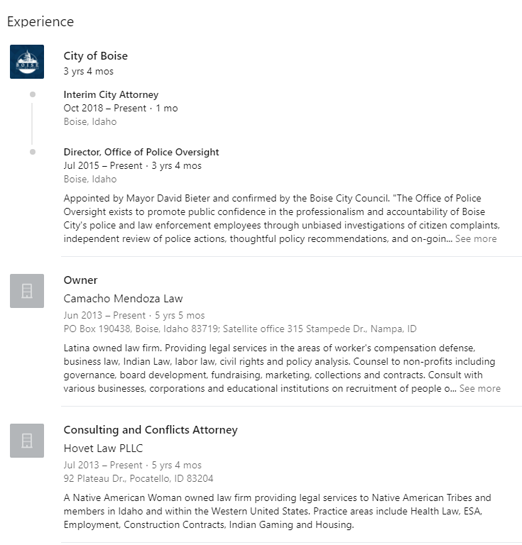 According to today’s “Idaho Press,” according to his LinkedIn profile, the city attorney for the past four years has also been head of an Idaho & Hawaii real estate co. since 2004. So the Boise Planning Director owns his own development firm, and the former City Attorney owned a real estate company? The Deputy City Attorney left and now the City Attorney left. What IS going on here, people?? EDITOR NOTE–Development Services Director has also left. The reoccurring theme here is the same appointment mechanism sans public hearings. The NPCs that vote for Team Dave accept this. When Brent Coles was mayor, or Kempthorne…there were calls for transparency. Now, Coles created his own mess and Dirk used the mayor’s office as a political stepping stone. Transparency is always warranted, no matter who is in office. This double duty attorney is problematic. Where is the loyalty? City Council or Citizens. Which hat does one wear? EDITOR NOTE–We are seeking documents to show her resignation as oversight director and appointment of interim attorney along with appointment interim oversight guy we are told is “watching things” at the oversight office. Doesn’t look like there was any council action or advertising of openings by HR dept. to do with moral so low at the police department. team and the crash reconstruction team. it pretty hard to prosecute cases. Does it cost monehh to send cases to the city attorney? Hmmm.. Let’s not do that. Stall. Avoid. Don’t offer appropriate professional inquiry. Nor read, nor fully understand the codes ahead of time like a licensed person would. Thus, we quit. Can you tell me more about Chief Bones and the PD? This is the first time I have heard anything negative. He honestly seems like a pretty wonderful person. EDITOR NOTE–From the perspective of this 50 year observer of BPD, Bones is the best we have ever had. He is the Boise police chief rather than chief of the Boise police, an important distinction.